My fridge is having a Lego outbreak apparently. 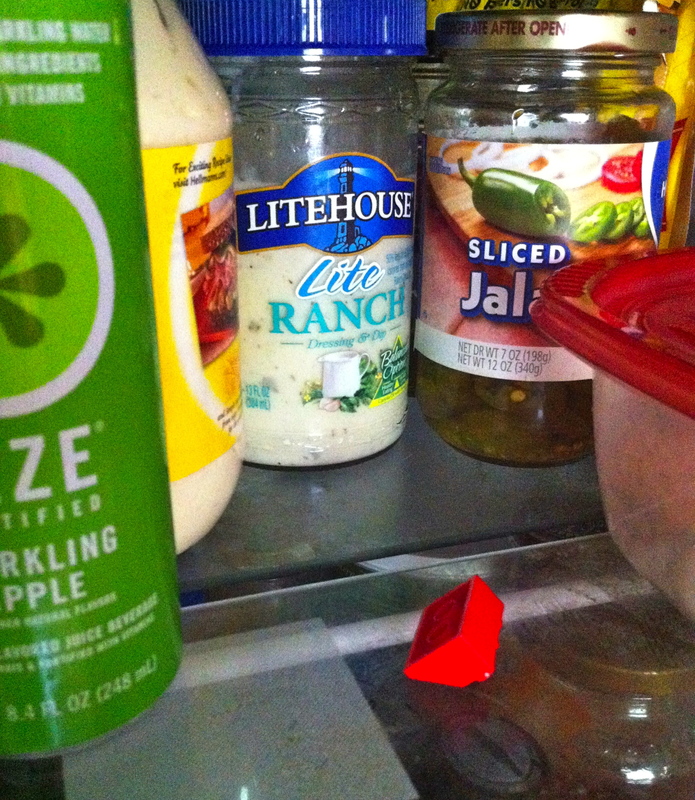 Last week, I opened up the refrigerator, moved a jar of pickles, and found a Lego. A friggin’ Lego. IN MY FRIDGE. Is no place in my home immune to Legos? I questioned the males who cohabitate with me and not one of them had a clue as to how said Lego came to reside in the fridge. Apparently it grew legs and opposable thumbs, opened the door, and walked in there itself. Why not? It doesn’t seem out of the realm of possibility when you consider the insidious fashion in which Legos have infiltrated our home. It’s honestly bad enough that I’ve come to think about Legos as a disease similar to herpes. (Yes. I know. I once referred to glitter as sparkly herpes. Apparently, a lot of things remind me of herpes.) But, Legos are just like herpes, only they’re more expensive. Explore this with me, please. Children aren’t born with Legos. They catch Legos from a “friend” who shares them without full disclosure about how this one fun encounter will forever change your child’s life. This is when the primary infection starts. The next thing you know, the Legos begin to spread. Hundreds, perhaps thousands, of pieces of Danish plastic insinuate themselves into your home. This week, for example, in addition to the find in my refrigerator, I’ve found pieces in the living room, the family room, the dining room, the kitchen, the basement, in two of our three bathrooms, in my car, and on the front porch. The poor dog has ingested and subsequently yakked up two Lego pieces in five days. (I’m sure she’s pooped some out too, but I’m not going looking for those so my sons will just have to consider those a lost cause.) The other night, I got into bed, rolled over, and freaked out when I felt something on my leg. Turns out it was a Lego. Lego Jedi Shaak Ti was in my bed. I’m telling you, we’re in the midst of a full-on outbreak in our house. Occasionally, the infection seems to dissipate because the virus goes dormant. The kids are outside more or become temporarily engrossed in other toys, like the Wii. I no longer find semi-permanent indentations in my bare feet from Lego pieces that have embedded themselves in my flesh. My house isn’t overflowing with Lego cities and vehicles and action characters. I start to think maybe we’re past this. Perhaps it was all simply a bad dream. Then, out of nowhere, there’s a recurrence. Crap. In the three years since Luke contracted Legos, I’ve learned that there’s no sense denying them or pretending they don’t exist. This is a serious infection. It’s not going to go away miraculously and, quite unfortunately, there is no cure. All we can do is manage the disease. So, we try to do that. We’ve bought him two large plastic buckets to try to contain his thousands of pieces. We’ve talked to him about preventing the spread of Legos. We’ve cautioned other parents about the disease as well. We’re learning to live with it as best we can. Yep. Legos are a lot like herpes. Perhaps the only difference I can see is that with herpes simplex the primary infection and all subsequent outbreaks come to you free of charge. These small, plastic Danish herpes are costly at the onset and for the entire future of the disease. If I could get back every dollar that has been spent on my son’s extensive Lego virus…um, I mean, collection…I’m certain I could have vacationed in Hawaii twice by now. I find it a bit ironic that if I’d only have gotten lei’d, perhaps none of this would have happened. They are definitely hard to contain and seem to pop up. It is also very necessary to be careful when walking in an area where they may be lying (stepping on one bare foot – ouch!). Unfortunately, in our basement (kidsland) I have to wear shoes on the soft, new carpet because there’s no avoiding them. Still…it’s just a phase, I guess. It’s being called into their bedroom to soothe them back to sleep and standing on Lego barefoot that gets me. It always hits that soft, sensitive instep….. Damn you, Lego (insert shaking fist here)!!!!! !